Co. Galway: Ardrahan (2), Beagh (2), Kilbeakanty (2), Killeenavara (2), Killeenan (2), Kilmacdooagh [Kilmacduagh](2), Kiltartan, Kiltormas, Kinvarra (3). The Board also included 6 ex-officio Guardians, making a total of 24. The Guardians met on alternate Saturdays. The population falling within the Union at the 1831 census had been 38,342 with divisions ranging in size from Killeenan (population 2,892) to Kinvarra (5,430). Gort did not form a division in its own right but included parts of Kilmacduagh, Kiltartan and Beagh. The new Gort Union workhouse was erected in 1840-1 on a seven-acre site at the south-east of Gort. Designed by the Poor Law Commissioners' architect George Wilkinson, the building was based on one of his standard plans to accommodate 500 inmates. Its construction cost £5,350 plus £1,150 for fittings etc. The workhouse was declared fit for the reception of paupers on 6th December 1841, and received its first admissions on 11th December. The buildings followed Wilkinson's typical layout. An entrance and administrative block at the south contained a porter's room and waiting room at the centre with the Guardians' board room on the first floor above. It appears to have later been extended to each side with the addition of children's accommodation and schoolrooms. 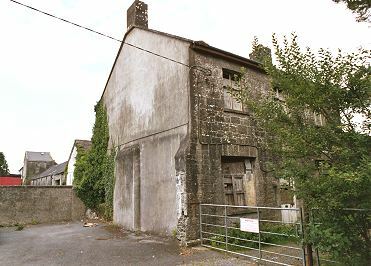 Gort workhouse central spine from the south-west, 2003. Gort workhouse site from the north-east, 2003. 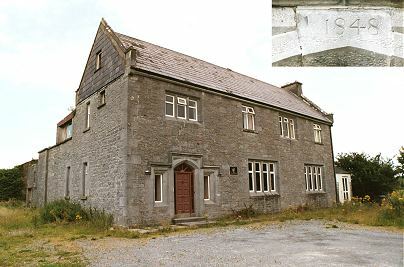 Gort workhouse - fragment of main building from the south-east, 2003. During the famine in the mid-1840s, sheds were erected to accommodate up to 100 fever cases. A fever hospital was erected in 1848. A surviving building to the west of the workhouse site appears to comprise the northern half and what would typically have been the centrally placed entrance of the fever hospital. 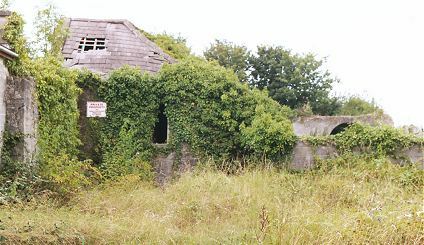 Gort fever hospital from the south-east, 2003. In May 1849, the "goods and chattels" of the workhouse were sold by order of the High Sheriff of Galway, to help pay off debts accumulated by the union during the famine. An English visitor in 1850 described seeing hundreds of women and children shivering in and around the grounds of the Gort workhouse. "What dress they had seemed to be the rags of the red petticoat of the country from below the waist, rags of some black stuff above it," he wrote. "Some of the infants were nearly naked, and very evidently in a most filthy state." The surviving buildings, largely consisting of the central spine and fragments of the main, utility and infirmary blocks, are now (2003) used as a council storage depot. Galway local archives, Island House, Cathedral Square, Galway. Holdings include Board of Guardians' minutes (1844-1921).